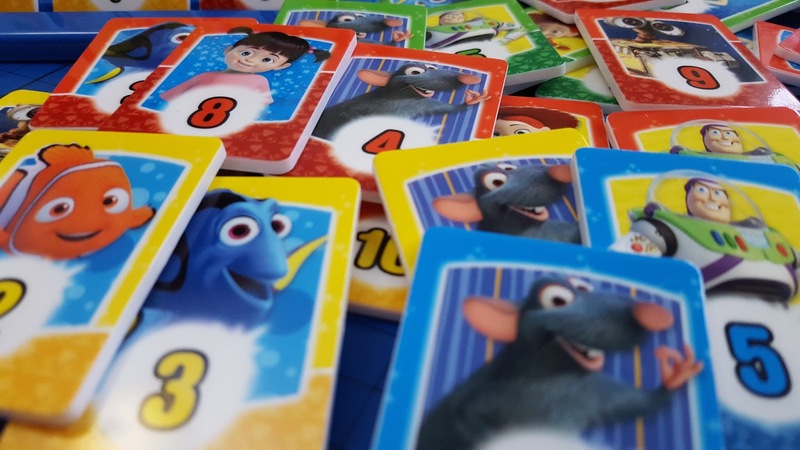 We've reviewed quite a lot of games from Esdevium recently, and the latest two they've sent for us to review are Disney Rummy (£17.99) and Disney Charades (£12.99). Two family games which can be played with your younger children, and still enjoyed by their Grandparents. 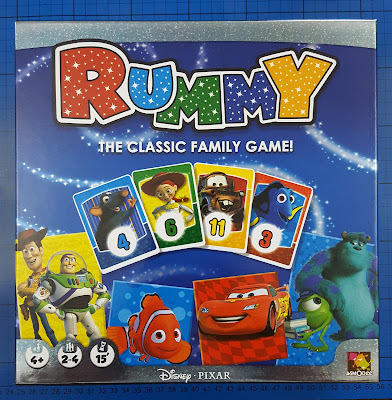 Disney Rummy is suitable for 2-4 players aged around 4+. 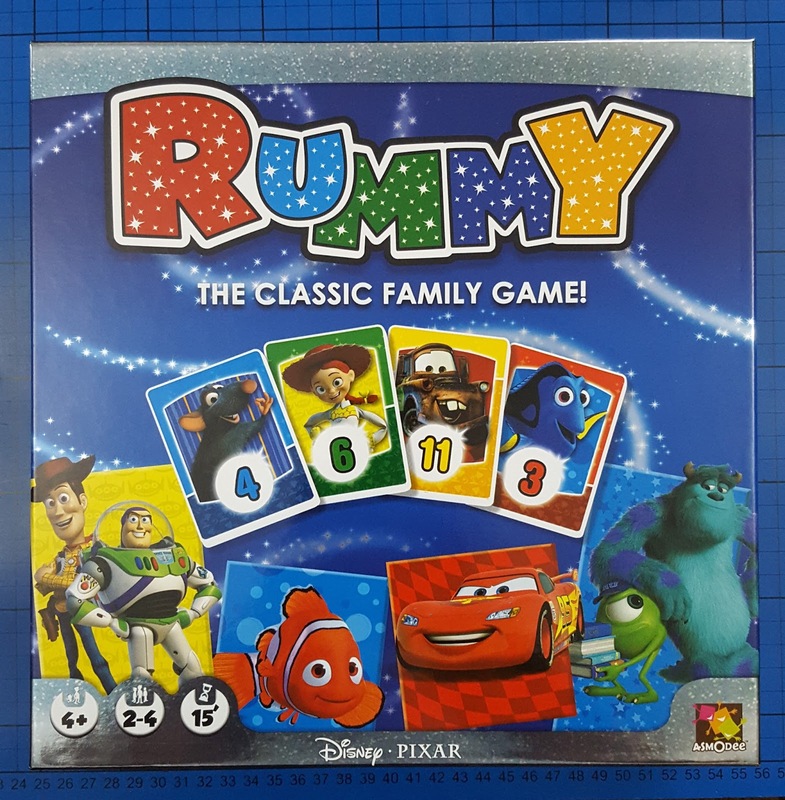 It's a simplified version of the ever-popular card game Rummy, but in this version there are 2 ways to play, and instead of cards we have plastic tiles. The tiles are easier for children to manage, and instead of a pile, you lay the cards face down on the table. For the Junior Version (age around 4+) you use the tiles as a matching pairs game, turning them over two at a time hoping to make a pair. This is a great game for teaching children patience and turn-taking, and increasing memory and observation skills. My 5 and 7 year olds had no problem joining in, and the teenagers played too. 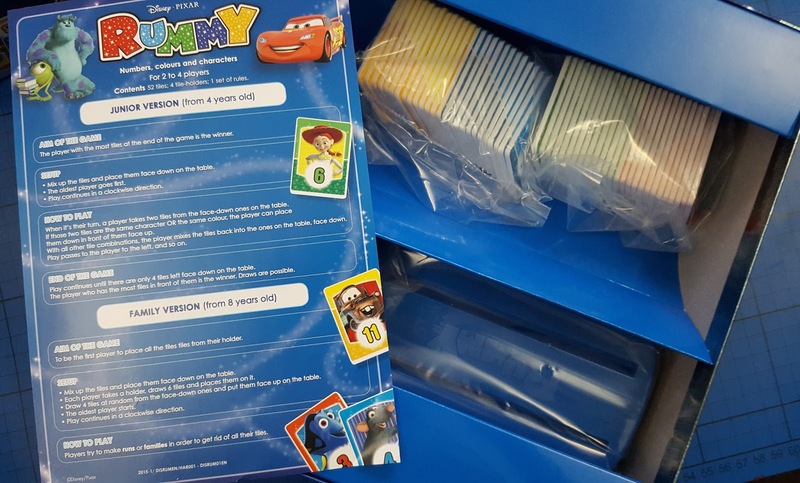 Each game only takes around 15 minutes, so it's very quick to play and the element of chance is huge, so children can beat their parents once they get the hang of gameplay. For the Family Version (age around 8+) each player takes a 'holder' and draws 6 tiles to place in the holder. 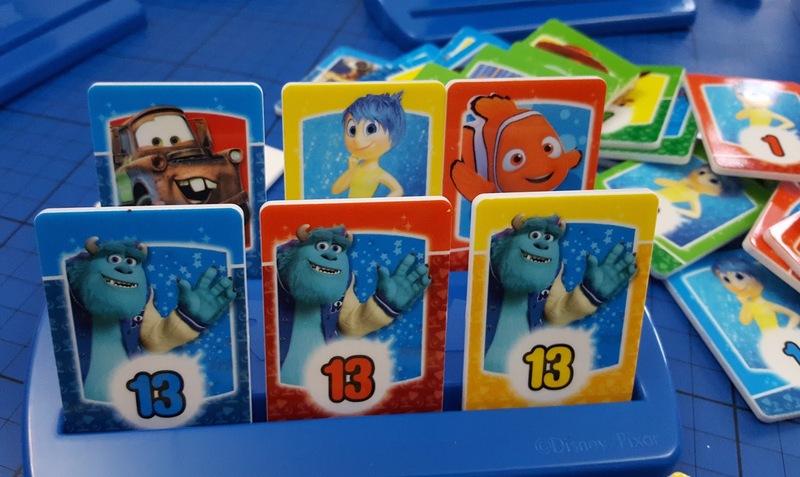 Very much like traditional Rummy, but you only have to make 2 matching groups of 3 - either a 'family' of tiles with the same picture, or a 'run' of cards with the same colour and numerical values in order, e.g. 4, 5, 6. Each turn you can exchange one of your tiles for another visible tile, or turn over another from the table to see if that's any use to you. 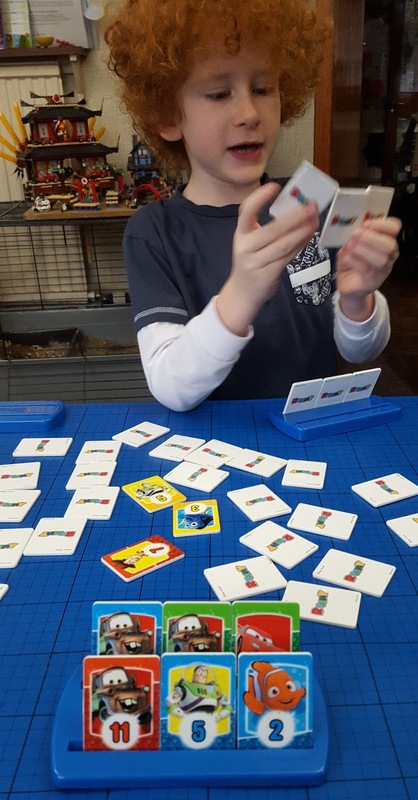 As your child gets older strategy comes into play - they can see which tiles the other players are taking and guess which 'spare' tiles they should hold onto until the last minute. 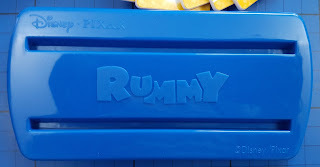 My 7 1/2 year old has actually played Rummy before, he very much enjoys it, although he didn't manage to win. 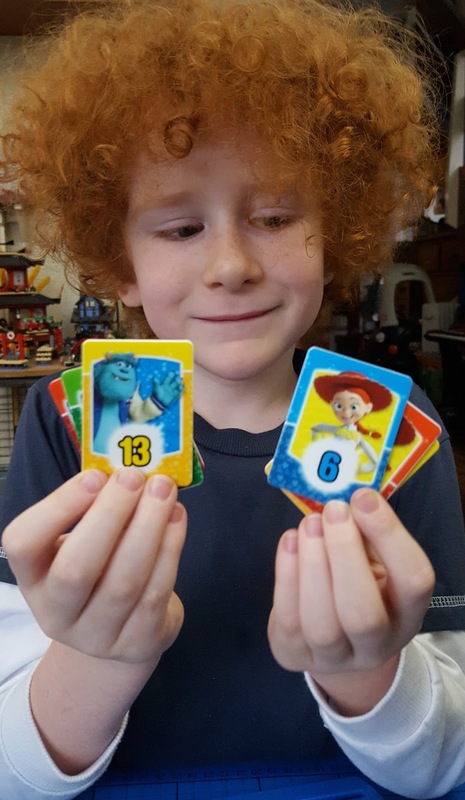 With the Disney Rummy he plays on a more even level. One of the big problems for him was holding playing cards, so he loves having the tiles in the holder. When I saw the game was played with tiles I did think it was quite novel, when someone spilt a glass of orange juice on the table I felt it was genius. We were able to rinse everything off and nothing was damaged. 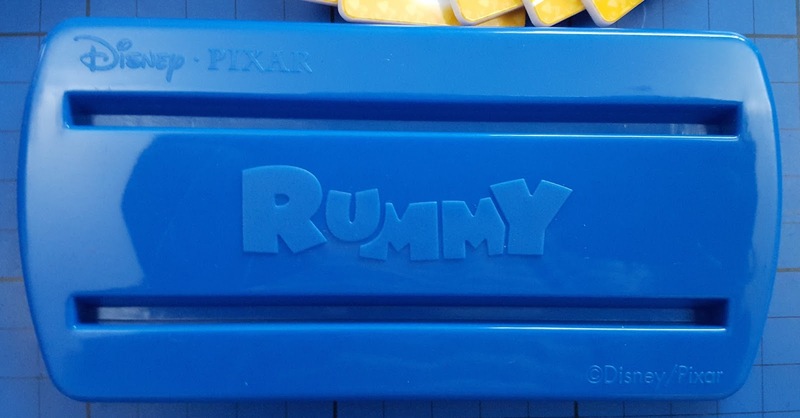 Rummy is a classic because it's so easy and quick to play and people of all ages can enjoy it. I think Disney have done a great job of making it more accessible for younger players, it's really nicely made, and with the addition of the Junior Version we can all play together until the youngest family member spots something shiny and wanders off, and then we can move on to the Family Game. Both Disney Rummy (£17.99) and Disney Charades £12.99 are available now. Published by Esdevium Games and currently with a small discount on Amazon. This looks great, thanks for the review.